Fuelled by pickup trucks and Detroit’s manufacturers in general, auto sales in Canada rose a little more than 1% in the first four months of 2013. Fast forward to May, and Ford Canada posted its best sales since 1997 with continued F-Series growth and big improvements generated by the Fusion, Escape, and Explorer. Volkswagen Canada sold more vehicles in May 2013 than in any month in history. The Jetta accounted for 45% of the brand’s total. Chrysler Canada’s Dodge and Ram brands, formerly a joint unit, were collectively up 16%. 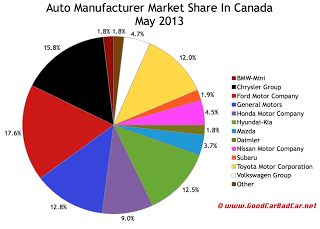 Overall, Canada’s automobile industry was up 5% in May 2013, pulling up the year-to-date improvement to 2%. This was the best May since 2007. Desrosiers says cars accounted for 46.5% of the market, down from 47.8% in May 2012. GM, Ford, and Chrysler were responsible for 46% of the industry’s volume, down from 46.5% a year ago. Highlights: Aside from the Cayenne, which represented more than half of the brand’s May sales, sales were fairly evenly spread at Porsche: Cayman at the bottom with 37, 911 at the top with 68. Kia’s three most popular models – Forte, Rio, Sorento – all posted year-over-year increases. At 3442 units, more than double what the whole Lexus brand managed, Toyota set another RAV4 sales record. Honda sold 152% more Accords this May than last. Acura posted another record RDX sales month. Nissan continues to tumble, with a 23% drop in car sales. 55% of Mazdas sold in May were fitted with SkyActiv engines. 46% of BMW sales came from X models, down from 54% a year ago. 31% of GM sales went to fleets. Mercedes-Benz sold 341 Sprinters in May, which means BMW outsold non-Sprinter Benzes by 39 units. Year-to-date, non-Sprinter Mercedes-Benz is 149 sales ahead of BMW in the “premium” category. Because B-Classes are really very premium. Best seller lists for cars, trucks, and SUVs will be added in the coming days. You can always find historical monthly and yearly sales figures for any brand by clicking the brand name in the table below or by selecting a make (or model) at GCBC’s Sales Stats page. At any time, you can click any column header to sort automakers by any which way: May volume, year-to-date volume, or even market share totals.